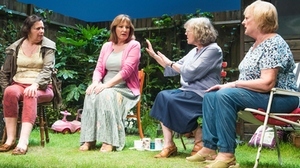 Caryl Churchill's plays have been important to women and in Escaped Alone four women in their 70s meet in a garden and converse. Three are already there when Mrs Jarrett (Linda Bassett) invites herself into the garden where Sally (Deborah Findlay), Vi (June Watson) and Lena (Kika Markham) are in conversation. They talk about banalities, their children, their grandchildren, mixing memories of the past with light gossip. When Mrs Jarrett attempts to join in, they either ignore her or briefly counter what she says. No-one seriously engages with her and I felt she was excluded and her intrusion resented. They started by asking, "Is it that woman?" establishing her otherness to them. From Miriam Buether's lushly planted garden set with ivy on the wall we cut in darkness to a stage framed by small red bulbs in a square, flashing lights and a terrible noise with Mrs Jarrett telling us about what she has seen in this dystopian future. This is a harrowing portrait of life after the nuclear holocaust for the survivors. Each sentence is a terrifying headline of a society breaking down but delivered in a matter of fact voice describing function rather than feeling or emotion and often with a quirky aside. These scenes are uncomfortable and unsettling to watch for our senses, like a headache. After Mrs Jarrett's monologues we cut back to the normality of the women relaxing in the garden. We start to learn about them. Sally, who was a doctor, is terrified of cats and is sarcastic and competitive, Lena has agoraphobia and is generally nervous, Vi, once a hairdresser, served six years in prison for murdering her husband in the kitchen and now cannot bear to be in any kitchen because of those memories. "If you have killed someone in a kitchen you're not going to love that kitchen." In the later scenes in the garden, individual women deliver a monologue while the other three remain impassive and the lights go down on all except the speaker. One scene has them singing "Da Do Ron Ron" for themselves, an unifying pleasure from their common past. The performances are superb: the wonderful, kindly Linda Bassett with her talent at portraying the best of humanity as Mrs Jarrett; June Watson's matter of fact murderess Vi; Deborah Findlay's sniping and well turned out Sally looking much younger than her 70 years illustrating the care and cost of that more youthful exterior and Kika Markham's, Lena, a bundle of nerves and phobias. When Lena talks about her ambition to go to Japan, Sally unkindly suggests she should first start with getting to the local shop. So what is Escaped Alone really about? Is it to show that our lives, however trivial, mundane or banal are really wonderful compared to Mrs Jarrett's terrible narrative of flood, starvation and mayhem? Or is Escaped Alone making an existentialist point about the lives of women? The very title, implying escape but describing the horrors Mrs Jarrett sees, is not an escape we would wish for and certainly not alone. to add detailed comments in the body of the email . . . also the names and emails of any friends to whom you'd like us to forward a copy of this review.